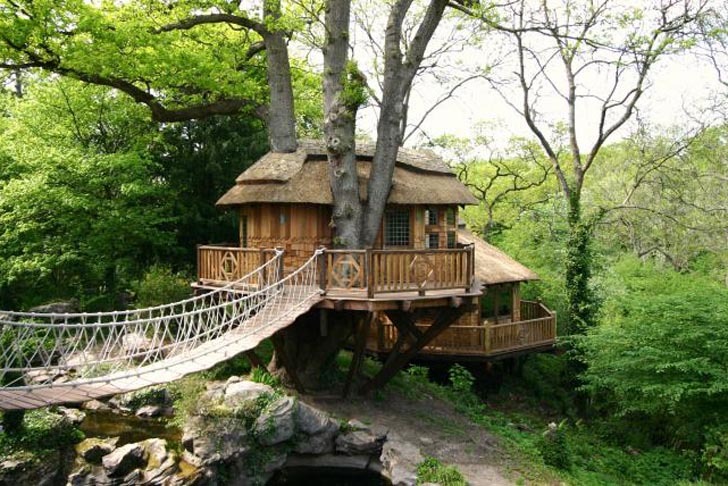 Sleeping in a space surrounded by gorgeous woodland is a truly magical experience, and its no wonder that treehouse design has inspired so many everyday living spaces. Handmade using local wood and topped off with a traditional thatched roof, Blue Forest's Cliffside Lodge is a luxurious home that wraps around a beautiful tree and can only accessed through a suspended rope bridge. Designed for a private client and set in their luscious garden next to a pond, Cliffside Lodge is raised just a few meters above ground. Constructed on stilts and wrapped around a centenarian tree, this woodland shelter can be accessed by a rope bridge that stretches from the second floor veranda of the main property. The treehouse’s interiors are cozy and the curving walls have been made from western red cedar, while the exterior was constructed using locally sourced wood and a biodegradable roof. In addition to infusing the design with the whimsy of a classic treehouse, the hand-built home also styles itself after the main thatched home on the property, which was built in 1886. Filled with books, art and even a hanging glass chandelier, this tiny shelter also boasts stunning 360 degrees views into the forest. Designed for a private client and set in their luscious garden next to a pond, Cliffside Lodge is raised just a few meters above ground. 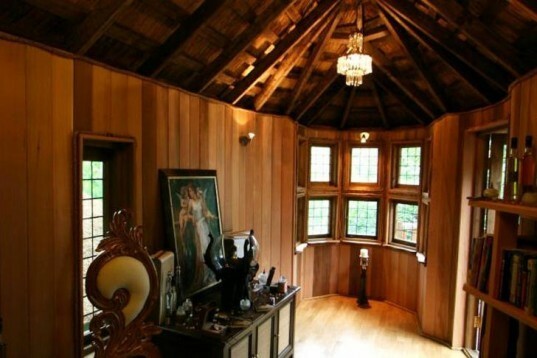 Constructed on stilts and wrapped around a centenarian tree, this woodland shelter can be accessed by a rope bridge that stretches from the second floor veranda of the main property. The treehouse's interiors are cozy and the curving walls have been made from western red cedar, while the exterior was constructed using locally sourced wood and a biodegradable roof. In addition to infusing the design with the whimsy of a classic treehouse, the hand-built home also styles itself after the main thatched home on the property, which was built in 1886. Blue Forest's Cliffside Lodge is a magical shelter that brings its occupants closer to nature.